Each of our Fast Shade Pop Up Canopies is a mobile marketing powerhouse, giving you defined installation space combined with high-quality advertising imagery. 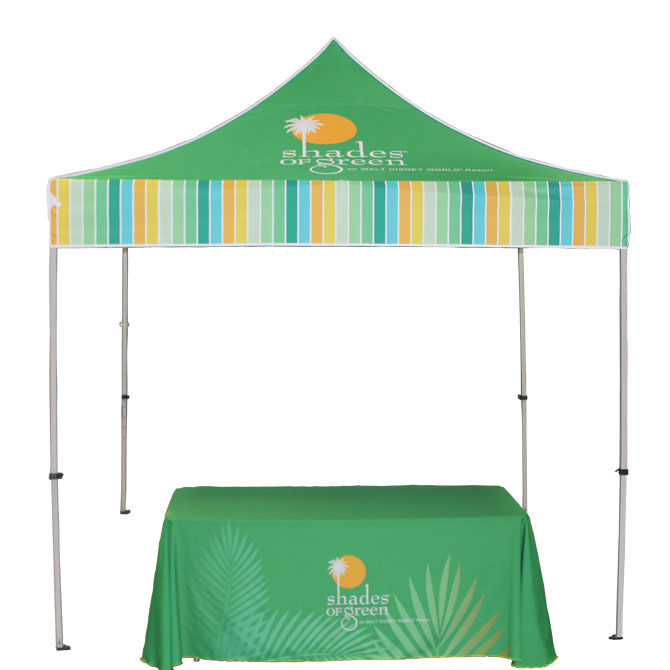 Customized artwork makes the canopy top a combined shelter and promotional set piece! Installations are simple and normally are fastest with two individuals. Removed from the storage and travel bag, the top is installed on the frame which is then expanded and locked into position. Don’t believe that it’s that easy? Watch out our installation and tutorial videos here to see for yourself! Canopy tops attach via hook and loop patches at the corners of the frame which also tensions the material as it is locked into the installed position. The single-piece framework allows you to quickly and easily install and strike your canopy in seconds, saving on time and energy. Telescoping frames are easy to lift with by a single person and are stored in wheeled roller bags for convenient travel.